I just love pincushions, they are whimsical yet functional objects that really reflect the users personalities. 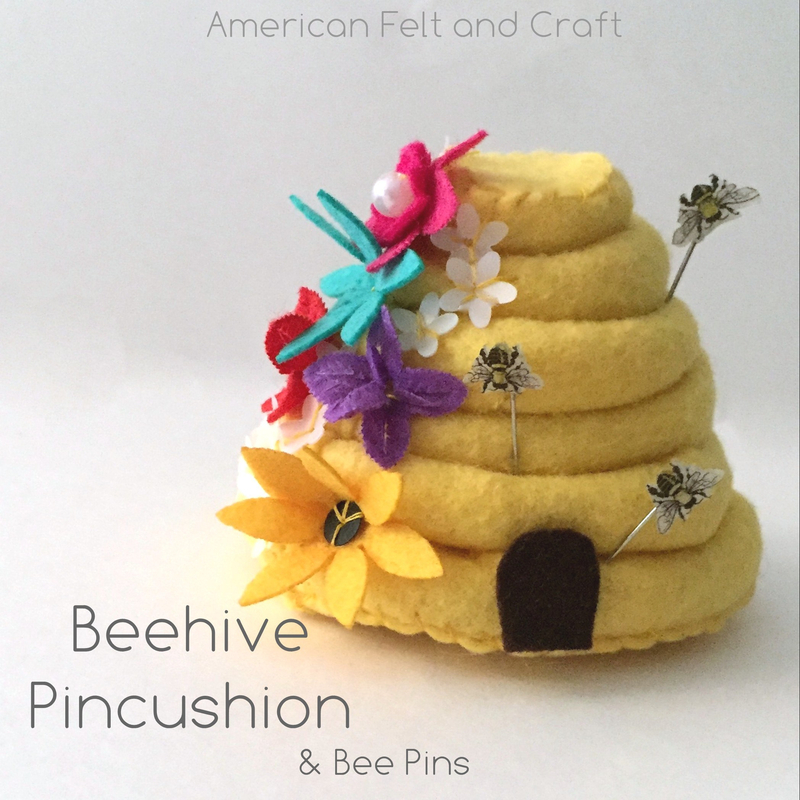 This beehive pincushion makes a lovely gift for the queen bee in your life. Dress it up with flowers or keep it simple and regal. The bee pins are a functional but fun addition that will allow you to keep a little spring with you all year long. 1- 9 x 12 sheet yellow felt I used Banana Cream Pie and matching thread. Doll Needle or long sewing needle. Craft Glue suitble for plastics and metals – I used a product diffrent product for this project but I found “Amazing Goop” worked better than the Gorilla glue. Shrink Film (printable inkjet is best) If you can’t find it or don’t want to print you will also need a black fine tipped pen. Laser printers work with heat and cannot be used for this project. Cut banana cream pie felt into 6 strips of 1.5″ wide felt in 8″,7″,6″,5″,4″ and 3″ long. Cut Bottom and top from banana cream felt and set aside. Cut hive opening from brown felt. Place long sides tether and overcast stitch up the side. Start this stitch about 1/4″ in leaving a gap on one end as shown. It is easiest to stuff this as you go but using a chopstick or pencil will help you stuff it afterwards if desired. Gather the end of the non gap side. 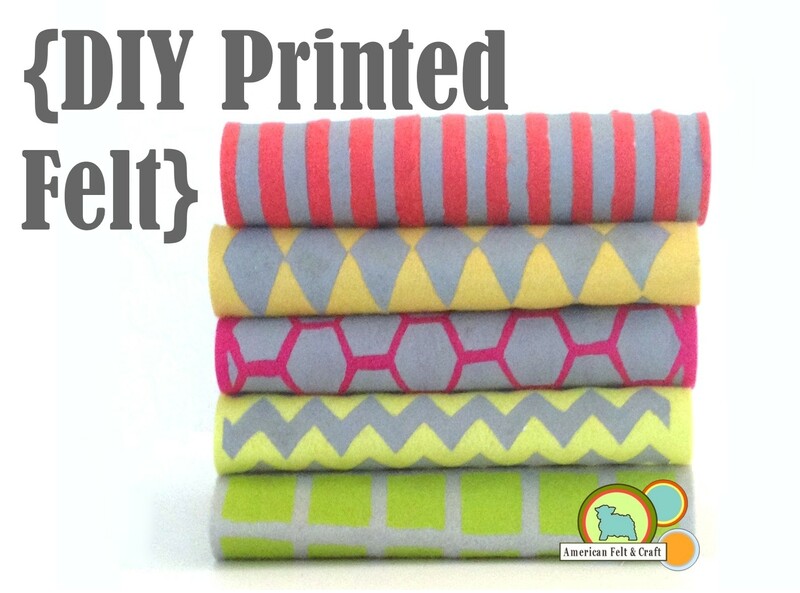 Gather and sew through to make it easy to tuck. Tuck gathered end into end gap, you will want to bend and work the stuffing into the right place to help it hold the circle. Sew through to hold (don’t worry we are covering this area with flowers. Repeat with all beehive pieces. Stack up the hive pieces from largest to smallest lining up the seams. Run the threaded doll needle through. Working your way around sew them together. Once all the pieces are together sew desired flowers into place. Accent with the baby’s breath sequins. Using felt glue add the hive opening. You can also sew this into place. Add top with an overcast stitch. Stuff or add a cloth bag of ground nut shells if you prefer. Sew bottom onto pincushion with an overcast stitch. Print bees onto printable shrink paper. Color centers yellow. Cut out bee shapes and shrink according to manufacturer directions. If you aren’t using printable shrink paper trace the bees with the fine tipped marker and proceed. Glue bees onto pins facing various directions using craft glue. I found the easiest way to do this is to put a pea sized dollop of goop onto a piece of paper and dip the end of the pin in and then lay onto the backside of the shape. Let dry as directed and enjoy! Can’t get enough felt pincushions, same. 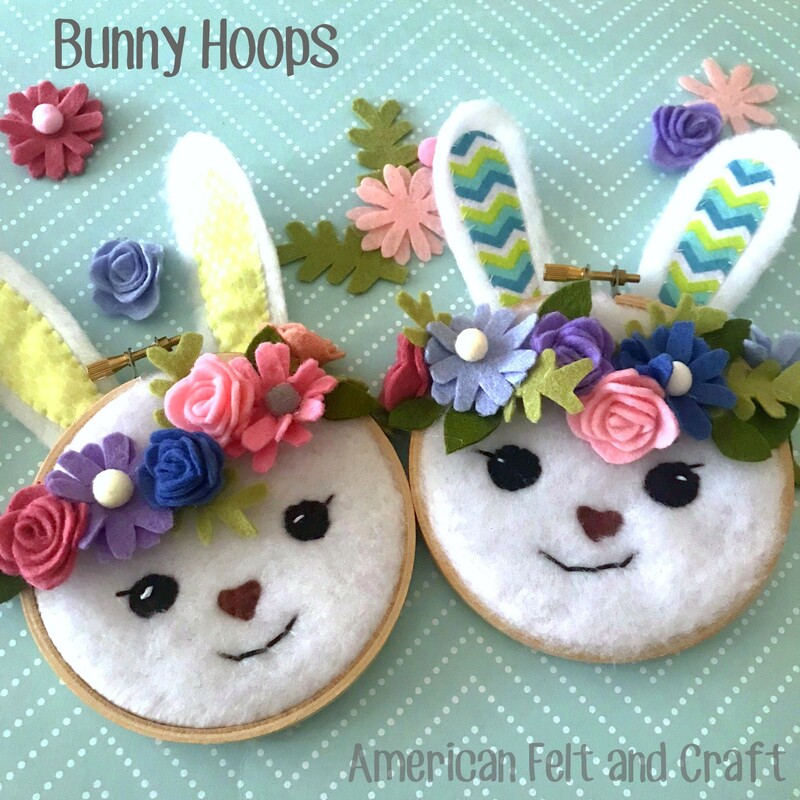 Check out these free felt pincushion tutorials. This creepy cute voodoo doll pincushion is a simple and spooky addition to your sewing basket. Able to hold all the pins you can possibly imagine yet always there with a goofy grin, he’s the ultimate frienemy! I wanted to give mine a bit of a vintage aged feel so I went with a wool blend chai felt, a milky grey beige tone but you can make this felt pincushion in any color of the rainbow. 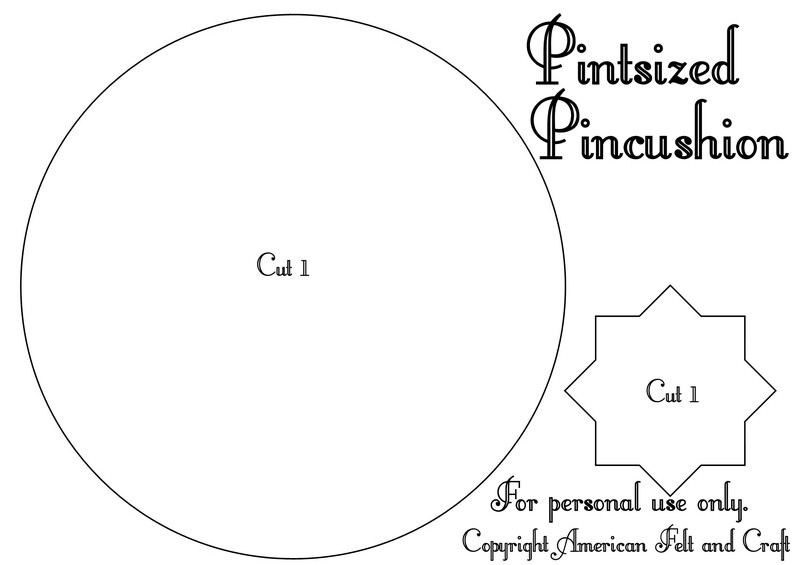 The same applies to buttons, any size or shape will do. This project is truly great for allowing you to use whatever you have on hand and is an easy project for even beginning sewers. Sew buttons onto front of one voodoo body side. Using one full strand of embroidery thread stitch mouth shape and stitch over as shown. Stitch down heart in an X shape. Place the two pieces together so that they match up. Using one full strand of embroidery thread overcast stitch around the outside, stuffing as you go. Enjoy your new friend…or enemy! Thanks to motherhood I can recite nearly every word to “Is Your Mama A Llama” which admittedly, is less impressive than the works of collected works of Keats but Keats doesn’t rhyme and is unlikely to inspire adorable pincushions. Embroidery thread in various colors, I chose a punch color, a mustard color, a sunny yellow, aqua and a blue. These tiny tassels are super easy to DIY and so super cute. I made these in a different color for each step in the interest of clarity but then I fell in love with the look and ended up using the multicolored versions on the pincushion. Pinch the top (where the knot is) and loop a second 6″ piece (mustard color) around 5x and knot tightly. Clip the ends. Fit scissors into the looped area and cut to create tassel ends. For this project knot the top threads (blue cords in the picture) 3 more times to give it something to hang from when we stitch it to the pincushion. Clip off extra thread. Cut 1 side and two tops from off white (Linen) felt. Cut 1 llama shape from Teal felt. Stitch design down as shown using a running stitch and matching threads. Attach sequins to the centers. For tips on attaching sequins read Attaching Sequins. Stitch Llama shape to the center of one of the round pieces using a running stitch and matching thread. For help cutting complex shapes see this post. Stitch blanket shape to llama with matching thread and accent with french knots in various colors. Attach top to sides using an overcast stitch and matching thread. Stitch down where short ends overlap with a running stitch. Stuff so the top piece is slightly rounded and begin attaching second round felt piece. Before sewing closed slip in smaller round cardboard piece to help the pincushion sit flat and allow the top to bulge out. Sew tassels along the top in the spaces between designs with a stitch into the knotted tops. To make pom pom pins you simply hot glue tiny pom poms to pins I am not sure how usable they are but they are so cute I think they still deserve a place on your DIY pincushion. Llama pincushion craft pattern- Print at full size. Now go forth and craft! If you’re going to sew your probably going to need a pin or two and a place to put all of them. These little felt sea urchins certainly fit the bill! 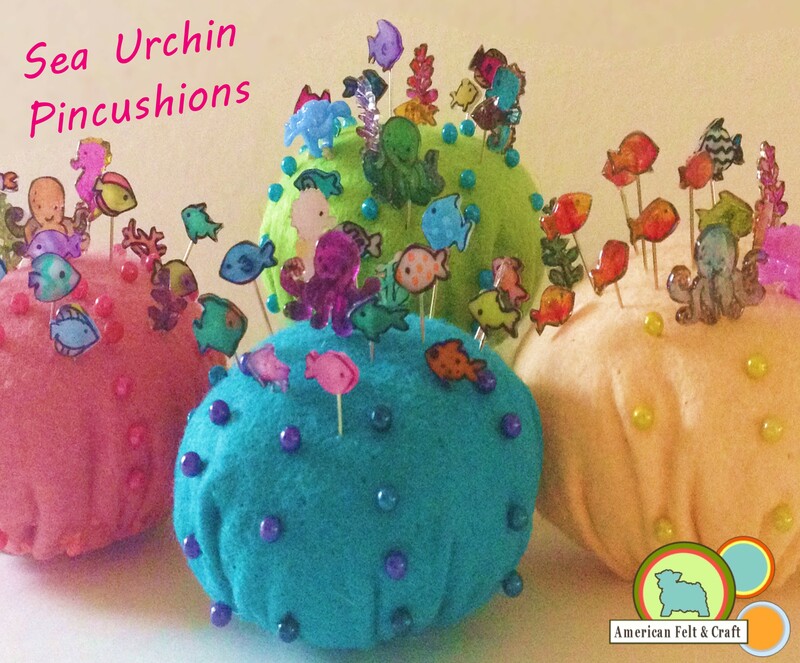 But one word of warning if you start making these you may forget all about sewing until you have covered most of the surfaces in your home with sea urchin pin cushions and hundreds nay thousands of fish, octopi, and seahorses. 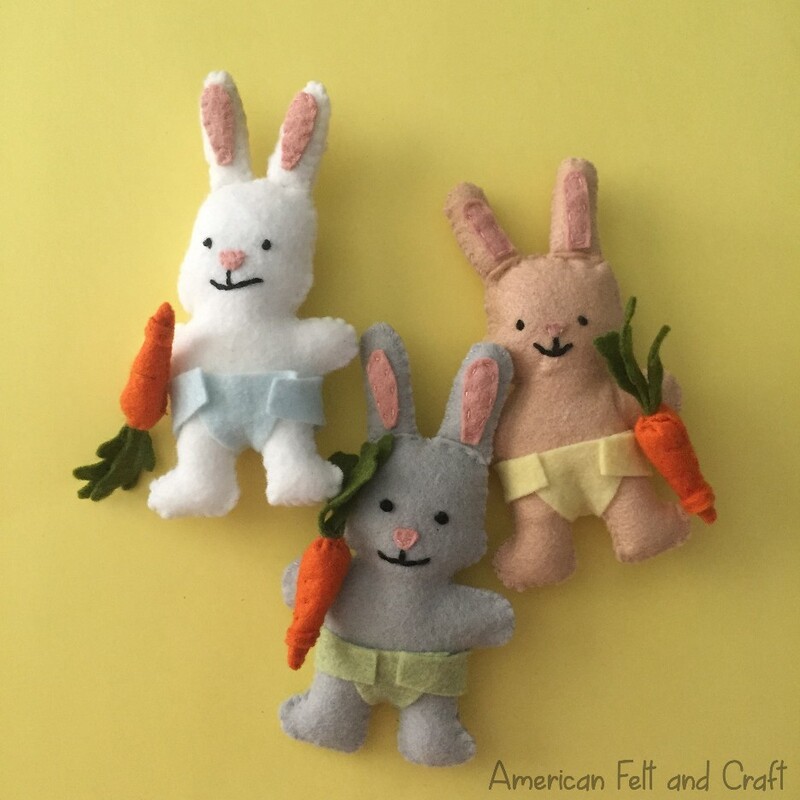 Summer sewing never looked so cute! Cut the circles from felt sheet, these guys go together pretty quickly, here’s the rundown. 2.Pull to create a bit of a cup and fill with stuffing. 3.Place smaller circle over the base and overcast stitch into place. 4. Turn over 5. Add flower buttons if desired. Add ball pins to urchin in a star pattern. Begin by prepping the shrink film, some shrink films are ready to go and need no prep otherwise you will need to prep it with a low grit sandpaper. Trace sea templates onto shrink film and color with permanent markers. Cut out shapes small scissors work best for this. Try to cut away as much of the clear edges as possible. Cut out the shapes and heat to shrink as directed. Shrink film shrinks differently depending on brand so your results may vary. Glue fish onto pins with craft glue, I used a product called Amazing Goop – because how can you not use a product called amazing goop! Need more felty ocean fun? And come on who doesn’t? Welcome back to Domestic Bliss Week. Today’s free felt ornament tutorial is a slightly more modern take on the classic “tomato” pin cushion. These guy are pint-sized about 2.5″ and are made from surprising shades like white and ice blue. Aren’t they just the sweetest? 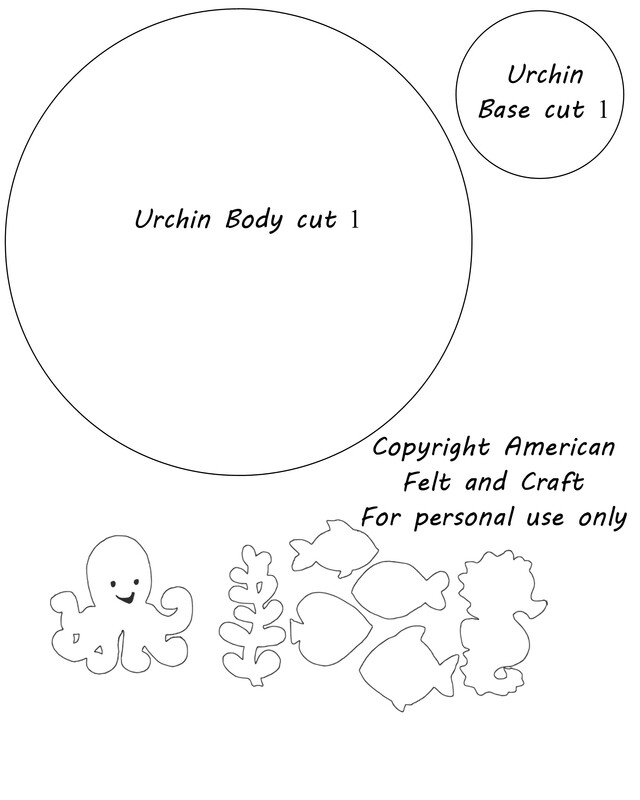 Cut 1 large circle for the base and one small star shape for the top. Using fingernail polish paint pins to match your color scheme. It may take 2 or 3 coats depending on your pins base coat. Attach a loop with embroidery thread to the center of the star-shaped top. Using embroidery thread gather circle and stuff before closing, you will be covering up the top so you will not need to cover the stuffing completely. Using contrasting embroidery thread section the ball shape into 6 portions. 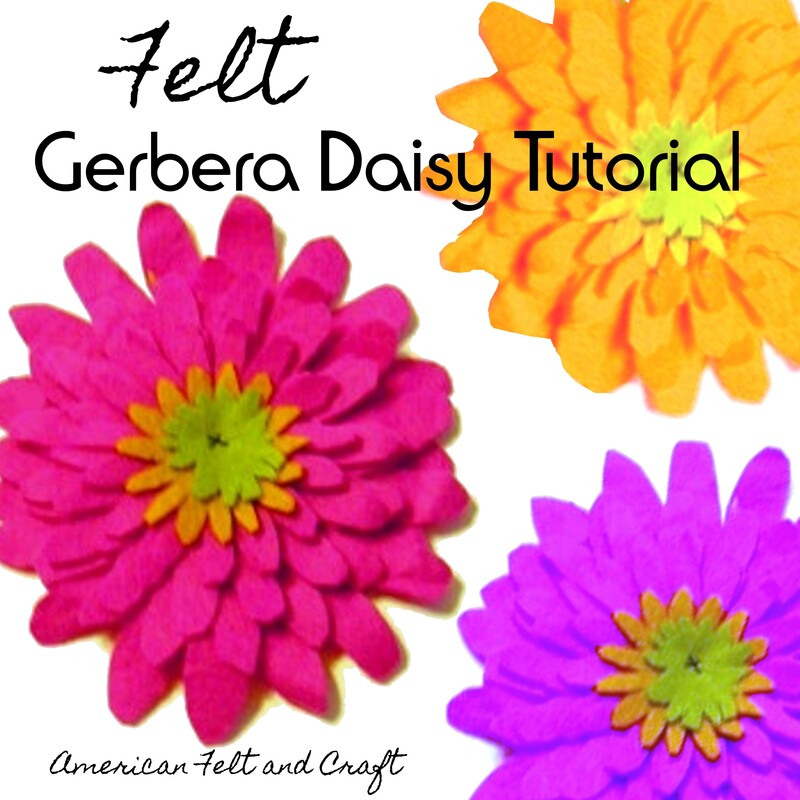 See our free felt food tutorial Felt Pumpkins for detailed pics on sectioning. Sew top over exposed stuffing. Play with the pins until you figure out the best way to arrange them. Remove one pin at a time so you don’t lose your chosen spots. Dip each pin end into felt glue and poke back into cushion. You should see a small bead at the base, this will dry clear and the build up will prevent any painful surprises under your tree. Welcome darling so pleased you could join us for Domestic Bliss Week. First on the schedule are these lovely seamstress cameo ornaments featuring a scalloped felt frame around a darling sewing themed silhouette. These sweet felt Christmas ornaments go together very quickly and make a great kids craft project. 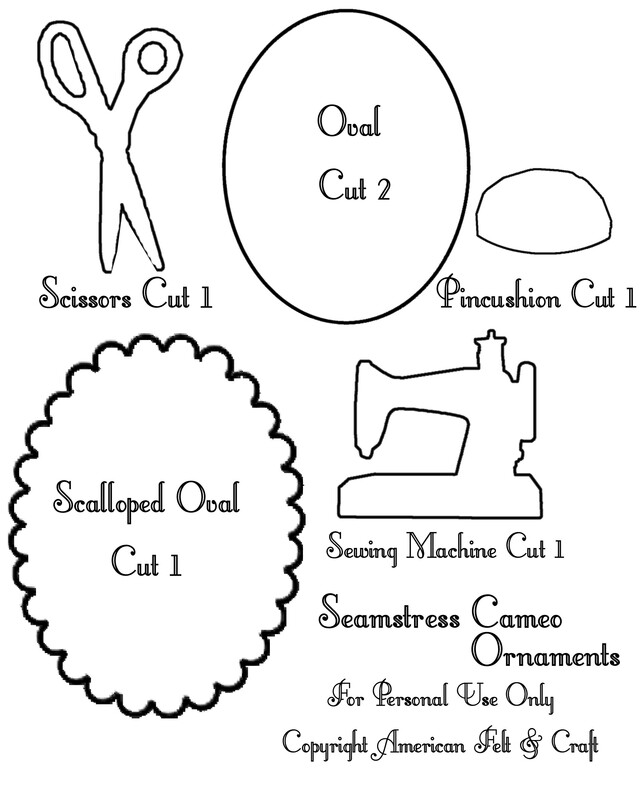 Cut 1 scissor piece and 1 scalloped oval from Ice felt and 2 ovals from white felt. 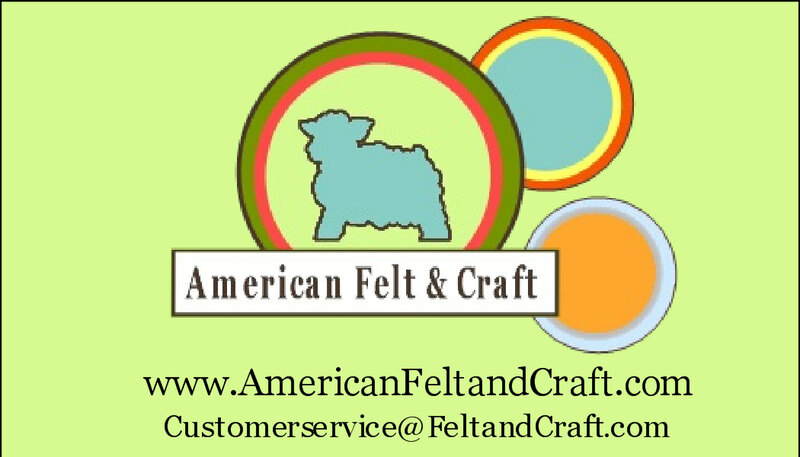 To cut centers from felt mark out the area to be cut out lightly in pencil and fold over to create an open space, work scissors around slowly until you have completely cut away the unwanted area. Stitch scissor shape to one of the white oval pieces and add sequin detail in Peacock. Feel free to do this on the other side for maximum Stepford points. Sandwich scallop between the two ovals and using a running stitch and white thread stitch together. Cut 1 scissor piece and 1 scalloped oval from Granny Smith felt and 2 ovals from white felt. Stitch machine and dragonfly sequin into place. Create the sewing machine needle with grey or sliver embroidery thread. Cut 1 pincushion piece from patterned felt and 1 scalloped oval from White felt and 2 ovals from Orchid felt. Sew cushion piece down. Use grey embroidery thread add “pins” attach sequins to ends. Using a leather or heavy-duty punch you can easily punch through multiple layers of felt. It’s best to do this AFTER sewing your felt ornament together. You can stitch around the hole for added durability but if you are using good felt it shouldn’t be necessary. Cut 8″ of ribbon and thread through the hole. Tie a knot and slide to the back. Cut 5″ of ribbon and tie into a bow around the loop. Fix into place with a quick stitch through the center to hold both the bow and the loop. Use fray check or clear nail polish on raw ribbon ends. 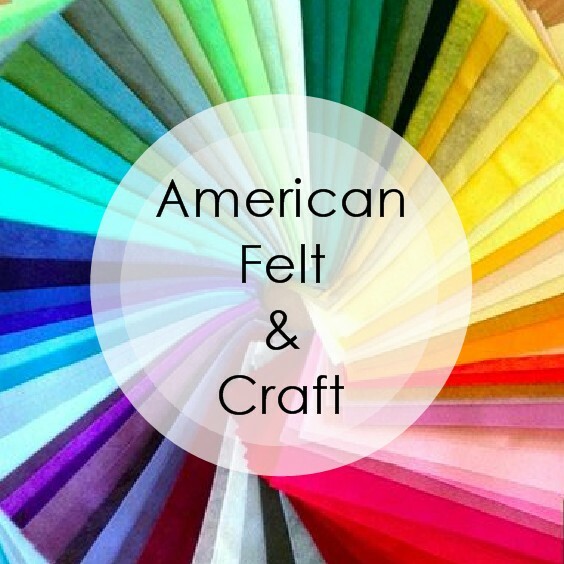 See our full line of Felt & craft supplies at American Felt & Craft.